When the starters pistol is fired for the 50th Two Oceans Marathon on 20 April there will be one Franschhoeker who will be watching the event with special interest. Bev Malan, principal at Sothebys International Realty Franschhoek, has a special place in Two Oceans history. A former Springbok athlete, Bev was the first woman to complete the gruelling ultramarathon in less than four hours when she won the 1982 race in 3:59:08. This achievement also made her the first female silver medallist at the event. To top it all, Bev and her husband. Danie, also achieved the distinction of being the first husband and wife competitors to cross the finish line that year. Bev won again in 1983, but missed the 1984 race due to injury, before completing her hat trick in 1985. This made her the first woman to receive a permanent number for winning the race three times. In 1986 Bev achieved third place against exceptionally strong competition despite running her best time ever. With such an illustrious Two Oceans pedigree its little surprise that on 28 February Bev was called on by a film crew working on a TV documentary to be premiered at a gala event on 16 April in Cape Town. Asked about special memories other than winning, of course Bev singles out running past Kirstenbosch to the sound of Chariots of Fire playing over the PA system. "That was absolutely unforgettable and immensely moving," she says. She also recalls an amusing incident from her first race. Coming up Constantia Nek and with 10kms to go, she asked a male competitor she was passing, "Is this where I have to start going for it?" Bev knew she had a chance at a silver medal if she finished strong. The male competitor however was really struggling and his response though in jest was something that is completely unprintable! 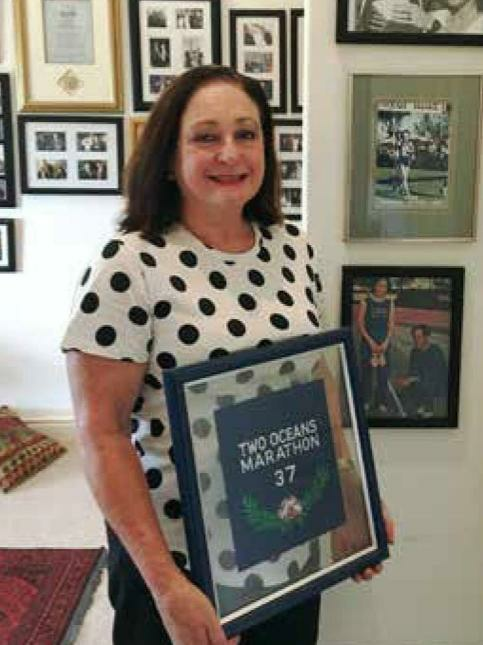 Bev Malan proudly shows off her permanent Two Oceans number. As is often the case, sporting success also led to professional success. After starting out as a medical technologist Bev entered the sports marketing industry. Her crowning achievement in this field was her appointment as marketing director for the World Corporate Games that took place in Johannesburg in 1994. Always looking for new challenges Bev entered the property industry in 1995, eventually becoming a top agent atClaire Difford Properties, before eventually settling in Franschhoek and buying the local Sotheby's franchise. A fit person all her life, Bev still enjoys long walks, goes to the gym and finds time for some tennis too.